The Rocrail documentation is kept up to the daily state of development (Nightly Build). This Wiki is maintained against the main line of development. Some features could be not available or are different implemented in your revision of Rocrail, but it is mostly noted with a revision number. Options and features not documented in the Wiki are for developers only and should not be a trigger to open a Forum thread. New to Rocrail? This guide shows the first basic steps and contexts for a successful start with Rocrail. Rocrail runs entirely on volunteer labor. However, Rocrail also needs contributions of money. Your continued support is vital for keeping Rocrail available. Support now by Bank account or Paypal. Objects for defining a layout. User libraries are not officially supported and are not part of Rocrail. The preferred method for a User Library is by MQTT. Dumper → Dump Text or file content to a serial device. 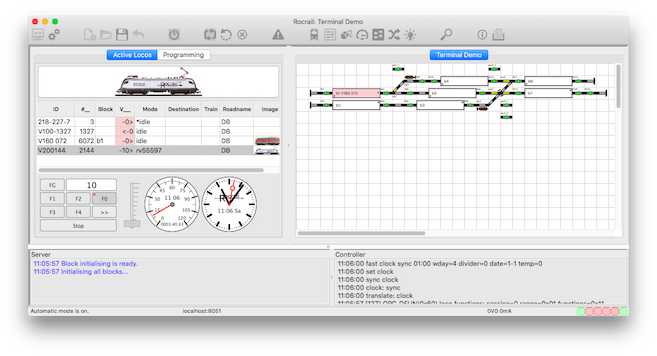 By creating a layout with Sensors, Blocks, and Routes, and then assigning your Locomotives to the Blocks, Rocrail can move the Locomotives by itself. You can use Schedules and Critical Sections to create and fine-tune complex movements for each Locomotive. R2Rnet; Rocrail servers in a network. Search for similar problems and their solutions on the Rocrail Forum. Jump only to the next item in the list if the previous did not solve the problem!